It looks like money, you say? But notice in the upper left-hand corner, it says it is “redeemable” in lawful money. Doesn’t that mean the bill pictured here was not lawful money itself? Are those words on the bills in your pocket or purse? Are your bills lawful money? Are they dollars? Under the portrait, you will notice a promise to pay ten dollars to the bearer on demand. Can paper become what it promises by removing the promise? If it could, why was the promise put there in the first place? In violation of our rights, no branch of government lawfully pays for anything! At best, they offer a clever imitation of a note that once bore a promise to pay. They can do anything to us as long as we think we are paid with imagined promises to pay. Shouldn’t you learn as much about money as those who first get all of it for nothing and control you with it? Read on! This booklet is dedicated in memory of that one man in a million who was one year old when the above statement was written in 1920, Merrill M. E. Jenkins, Sr. (1919-1979) the first Monetary Realist. As his inventions in vending devices and other fields reached millions, his discoveries in Monetary Realism are reaching more. He was the author of seven books on the subject with the first being Money, the Greatest Hoax On Earth. 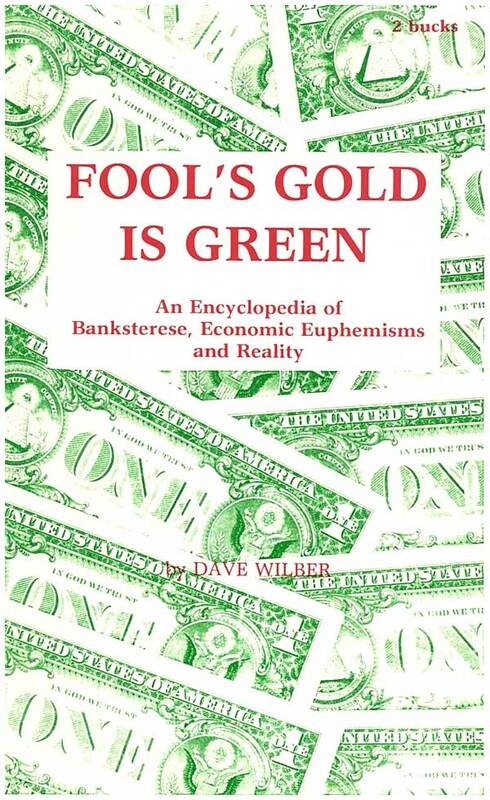 This book is just one of many by him and others to bring you Monetary Realism as opposed to economics, the “dismal science,” the science of monetary deception. Monetary Realism is the science of exposure and revelation of monetary skullduggery and economists. This book will be a test of your COGNITIVE DISSONANCE. As explained by a great writer on mind control, K. M. Heaton, the theory of cognitive dissonance is a theory that the mind involuntarily rejects information not in line or cognizant with previous beliefs or actions. That is, people believe what they like to believe or things similar to other things they believed before. There was a time when they believed the Earth was flat and those who knew the truth were punished or ostracised for expressing a different view. It can be very difficult for well fed, comfortable and amused people to conceive of a system of plunder that they, their parents and grandparents were born into along with the plunderers, their parents and grandparents but the failure to believe in such a system does not prove its nonexistence. Instead, it assures that the system will continue until the victims lose all rights to private property and are reduced to serfs. One of the first acts of Jimmy Carter as president was to sign a treaty with the United Nations authorizing them to abolish all private property. Though many weekly papers printed this, the author knows of no daily papers that did. If the economists do not know what the “money” is, how did the economists determine that the banks created the money? If the economists do not know what “money” is, how come 200 million people think they do know what “money” is? If the economists do not call the paper and metal tokens in use today “MONEY,” what do the economists call the paper and metal tokens in use today? When you lose due to inflation, someone [else] GAINS. Your wealth can not just disappear into thin air unless it was gaseous in the first place. When millions are losing thousands by inflation, a handful of men somewhere are gaining by the billions or trillions. It should be expected that such men would train and hire all of the economists they need to confuse everyone including those economists about inflation. For the few to control the many with inflation fear, chemicals, tax illusions, and propaganda, their victims must not know what inflation is, who creates it, that they are controlled with it, that taxes are illusory or why they have the illusion. Nor should they know why their water is fluoridated or the true purpose of the FDA. Amusements must be everywhere for everyone. To muse is to think. Amuse is without think. Amusements are devices intended to keep us from thinking about things that we should think about such as money, taxes, government, freedom, and liberty. The Romans had bread and circuses. We have food stamps, football, foosball, fools on TV ad infinitum. There is no purpose on Earth for economists than to confuse everyone including themselves about inflation. CPAs are people you hire to certify that you are as confused as they are. We must either seek fusion (unity) or confusion. Economists, accountants, lawyers and bankers are united against us whether they know it or not. No man’s judgment can be any better than his information says Stuart Crane Ph. D. What do we have when information is kept from the economists, accountants, lawyers, bankers, doctors, teachers etc. Whom we trust? When a handful of men create unlimited money (credit) out of thin air and get everything for nothing with it, why should they share all of their secrets and see their privilege to create unlimited money abolished? Shouldn’t you expect them to work hard at maintaining secrecy by all means of communication? The goldsmith eventually became aware that only about 10% of the gold they stored for others was ever claimed and the rest just collected dust. Finally, on one fateful day, a goldsmith issued a receipt for nonexistent gold and either spent or lent it into circulation AS money. Inflation was born! There was no INCREASE in the money supply as economists are trained to teach us the “cause” of inflation. There was only an increase in the RECEIPTS for money (gold). Inflation then as now was a fraudulent claim for wealth. When the 2nd such fraudulent receipt defining ‘inflation’ as an “increase” (of something) only deceives the victims as to what inflation really is and paves the way for more inflation is the form of fraudulent receipts for wealth. “At one time bankers were merely middlemen. They made a profit by accepting gold and coins brought to them for safekeeping and lending them to borrowers. but they soon found that the receipts they issued to depositors were being used as a means of payment (but were not actual payment). These receipts were acceptable as money since whoever held them could go to the banker and exchange them for metallic money. AND WHEN THEY DID NOT KEEP ENOUGH GOLD ON HAND, THEIR FRAUD WAS EXPOSED AND THEY WERE HUNG BY THE NECK! When they held only 1,000 ounces of gold and issued notes for 12,000 ounces, what do you suppose happened when 10% of the noteholders showed up to claim their gold? Creating money out of nothing was fun and profitable but the hangings caused convulsions and DEATH. How could they continue this fraud without the hangings? Well, the problem arose when too many notes were presented for redemption. What would happen if they knew that one person kept many notes in his house and they burnt his house down? There would be no problem with redeeming those notes would there? What if he had his notes hidden somewhere and they simply killed the note owner? What if they hired someone to steal the notes while he slept? What if they established a government and taxed the notes away from everybody who had them and taxed gold away from those who had gold and used that gold to settle the claims of survivors who still had notes? What if they used all of these means and still could not get the notes out of circulation fast enough, do you think they could collect more taxes if they kept the people believing that a powerful enemy might invade them and high taxes were needed to provide for a defense? Would the bankers create and sustain an “enemy” just for that purpose? We are told that Russia borrows from western banks and the Bible says: “The borrower is servant to the lender.” (Proverbs 22:7) Do YOU think the Bible is wrong? Would you rather just think this verse is being misconstrued? Can you think of why the Russians would give up their valuable gold for paper that cost the world banking system nothing if they were not in fact servants of same? In 1848, bankers hired a man by the name of Karl Marx to draw up a plan to perpetuate their plunder with non-redeemable notes. It is known today as the “Communist Manifesto.” The 5th plank called for the establishment of a central bank which would legalize what bankers in the establishment of a central bank which would legalize what bankers in the past were hung for, the process known as “fractional reserve banking.” The 1st, 2nd, and 3rd planks call for real estate tax, income tax, and inheritance tax to get their fraudulent notes out of circulation after they plunder us with them. Rebel against these taxes and you learn about the 4th plank which calls for “confiscation of property of rebels!” The 10th plank calls for “free education in public schools” so that acceptance for this system of plunder is gained at an early age. There are millions of Americans aware of most everything written here who agree that every president in this century has been owned by the bankers along with all of their appointees and employees. It seems that they fail to see the only purpose of all of those people which is to see that their masters keep creating money out of thin air to control all of us. Probably most of our Congressmen are honest people who think the President and his cabinet aim to serve the American people but the Bible tells us that no man can serve two masters. So the cabinet members, their employees, and the President testify before Congress to influence legislation that will give the bankers even more control over us. In addition, they influence the news media that influences us to demand the legislation they need to control us. It IS a cancerous system! In colonial times, this country was plundered with non-redeemable paper currency known as the “Continental dollar” and the people suffered greatly under the legal tender laws that compelled them to accept nothing for something. In 1789, our Constitution was written to protect us from such inflation and the tyrannical government it makes possible. Legal tender was prohibited in Art. 1, Sec 10 with the words: “No state shall pass any law impairing the obligations of contracts” AND the 5th amendment words: “… nor shall private property be taken for public use without just compensation." For an accurate description of that period of history, please see The Miracle On Main Street by F. Tupper Saussy. This book has the solution to our problem with inflation. It is not possible for people to control public servants when the servants print paper that the people call “money” and accept as payment for all of their labor. When they accept such paper, they cease to have servants and gain MASTERS. In the Constitution, Art 1, Sec 8, we authorized Congress to COIN money (not print it), regulate the value (weight) thereof and of foreign coin and to FIX a standard of weights and measures (for the coins). When we authorized them to borrow money, we authorized them to borrow some of the metal that they coined. Today, they only record that they borrow and there is no limit to what they can record. THAT explains why we can’t control them. He who pays the piper calls the tune! On April 2, 1792, Congress passed the MINT ACT which established gold and silver coins as the money of account and FIXED the dollar as a WEIGHT of gold or silver in coin form. They also provided a penalty of DEATH for officers of the mint who might take part in debasing our coins because they knew that counterfeiters could overthrow our Republic. It wasn’t too long before somebody divided the 480 grains in an ounce by the 24¾ grains in the dollar of gold and came up with a “price” of gold in dollars per ounce which is little different than dividing the number of ounces in a gallon by the number of ounces in a pint and obtaining the price of milk! Nevertheless, gullible citizen accepted this bit of legerdemain entity rather than a measure of weight fixed by Congress. It was just a matter of time before the people believed that entity was a piece of paper. It it were, wouldn’t 10 dollars have to be 10 pieces of paper? The day of infamy was December 23, 1913, when Congress passed the Federal Reserve Act and, in complementing this 5th plank of Karl Marx’s communist manifesto, they legalized what bankers in the past had been hung for. Though we authorized Congress to provide penalties for counterfeiting, this infamous act provided presses, paper, ink and labor for counterfeiting by government. To control the volume of counterfeit used by its victims, the 16th amendment was passed in the same year, i.e. Marx’s 2nd plank, a progressive income tax. After all, what good are 200 million slaves who consume all they produce? Careful observation of the legislation promoted these days indicate that our sub rosa government’s total efforts are in finding even more ways to regulate our consumption even if they have to kill us to do it. The diabolical thing about it is that they use their controlled press to get us to demand the legislation they need to control us — be it for taxation, fluoridation, busing or whatever. One thing the sorry 16th DID NOT DO was to authorize compulsory filing of income tax returns! It could not do so without repealing our 1st amendment right to remain silent, our 4th amendment rights to privacy and our 5th amendment right not to be a witness against ourselves. These rights, as well as rights guaranteed by the 9th and 13th amendments, are waived when any person files a tax return. If Congress could pass a law that requires us to waive our rights, then we have no rights! Is THAT right? No such law has ever been passed. How then are people who assert their rights convicted? Well, the truth is, that you have no more rights than what jurors know about and Marx’s public schools were not intended to teach citizens their rights! With enough educated jurors we could break the bankster’s stranglehold on us. It has been reported that it is nearly impossible for the IRS to get a conviction in Montana due to an educational campaign there. As for the rest of the country, there are fewer than 500 convictions per year with some 25 million less filing over an 8 year period. A conviction is “milked” for all it is worth to terrify hundreds of thousands of the Fed’s victims. First, there is a news release that the victim was arrested and charged with “willful failure to file!” That terrifies some. Then there is a rigged trial where the judge and prosecutor intimidate a jury they choose. Another news release the victim was found guilty. That terrifies people again. Then several weeks later, the victim is sentenced followed by another news release. He appeals. Eventually, the appeal will be denied and the victim is sent to jail with still one more news release. See how much “mileage” they get out of just one victim? There is no way a victim can be freed upon appeal because if he were, everybody would copy what he did and wreck the system. Murders and rapists are freed because they pose no threat to the Fed’s system of plunder, in fact, they are allies because their release helps to create an aura of justice. Worse yet, they will defend and reelect the plunderers while they ridicule and condemn those who try to expose them! Try to tell a graduate of the public fool (sick) system that the monetary system is not right and they are quick to insist that it “works.” And it is working them out of lives, liberty, and property! Graduates of the private schools are little wiser. Their textbooks may have been written by victims of the public fool system. There can be no modern wars and no communism without bank credit and legal tender. Communism is just a sophisticated theft. The credit and legal tender tokens are like the leavings of pack rats, animals that steal shiny objects and leave sticks or stones in their place. Taxes and tax illusions conceal the theft in two ways, one is that they get credit and legal tender away from us after we are robbed with it so that a certain scarcity is maintained which is a basic requirement for anything to serve as money. Secondly, it leaves the thought that government wouldn’t tax it away from us if they did not need it to spend themselves. Endless reports of “wasted tax dollars” divert the people’s attention from the truth that there are NO tax dollars that go anywhere. How can YOU send them any money when all you have in the bank is numbers and the Fed states: “The Federal Reserve system (of plunder) operates (on us) only with credit”?? Beware of any economist or economic writer who speaks of money AND credit. Money IS credit! You don’t send the IRS money, you send them an authorization for your bank to reduce your credit. The IRS neither wants nor collects money. They are forbidden by official guidelines to even tell you what is current as money. See Congressional Record Feb 21, 1979, page E609. So, with the Fed creating unlimited credit, they must control the volume to remain our “absolute masters.” With money being anything USED AS a medium of exchange, there are 3 ways to control the volume. They can tax it away from us so that we don’t use it. They can demand high interest (usury) to discourage usage and they can simply see that users or potential users of credit are exterminated. WHO should go? When they need less consumption and more production, they need to eliminate non-productive consumers. You know what they are doing about babies! Sugar, salt, tobacco, aluminum, and fluoridated water over a period of years with perhaps other slow poisons help to ensure that we expire before we retire. Whenever you visit a Veteran’s cemetery, remember that paper money made it possible. The newspapers keep us fearful of a country can’t whip Afghanistan in three years and Napoleon said that he feared three newspapers more than 100,000 bayonets! Students of this conspiracy will agree that Russia has owned by New York and London bankers since 1919. See None Dare Call It Conspiracy for more on this. Hopkins’ words were really proven accurate when the Treasury began to steal our silver with the Thomas amendment to the Agricultural Adjustment Act in 1933. It provided a tax of 50% on all private sales of silver when the “price” of that money was 80 cents an ounce. Simultaneously, the treasury agreed to pay 50 cents an ounce for silver. When Congress fixed the dollar as 24¾ grains of gold, they also fixed it as 412½ grains of silver or about ¾ ounce of silver. That meant that 50 cents were &frac38; of an ounce of silver. So, with the treasury “paying” &frac38; of an ounce of silver for an ounce of silver, they were stealing &frac58; of all silver produced and the victims could not see it because they thought the dollar was a piece of paper! Please keep in mind that all if this skullduggery was possible because the bankers owned the President and his Secretary of the Treasury. Of course, they also own the Secretary of Defense, Secretary of State and everybody else they need to provide us with wars whenever they think they need one to thin our ranks or to distract us. We are supposed to believe that Liberty Bonds in 1918 and Saving Bonds in World War II were used to finance these wars but the truth is, the Fed created all the credit they needed out of thin air and the bonds were used to reduce our consumption so that we would not bid prices to the sky and expose their fraud perpetrated with the credit. Who would ever consider that government prints the bonds AND the paper with which to buy them? Yes, Hopkins was right! As they kept printing more paper and more people were wanting silver coins, it looked like the “price” of silver could exceed 1.29 pieces of paper called “dollars” per ounce and the people might melt the silver to exchange for paper bills at a “profit” so the silver coins had to be taken out of circulation. The Vietnam war provided an outstanding smokescreen for the confiscation of our silver. The Tonkin Gulf “incident” that provided the excuse for bombing North Vietnam was in August 1964, just weeks before Congress stopped coining money (silver) never to start again. We were told that food and technology were given by us to Russia during that “war” and also told that Russia supplied North Vietnam. We might well have sent it direct and we may have actually done that too! In any event, both sides were financed with credit that bankers created out of thin air. “The Federal Reserve system operates (on us) only with credit,” said the New York Federal Reserve bank in 1960 in Keeping Our Money Healthy. Do you like to be operated on? Gold and silver coins are barter. The diabolic aspect of this system of plunder is that the victims can not see they were robbed as if a purse was snatched. They end up with a piece of paper that permits them to steal an equal amount (less taxes) from their neighbor IF THEY HURRY. What most fail to consider is that the first user of the paper got it for absolutely nothing and the last user MUST get absolutely nothing for it. Those in between help the first user rob the unknown last user and are proportionately robbed themselves depending on how long they held it. They seek the paper while condemning inflation not knowing they are one and the same. We are a nation of destabilized double-thinkers. George Orwell was born 30 years too soon! When Jesus gave that order, Caesar was the master. The People in Washington are supposed to be our servants. They are supposed to render to us the services we authorized in the Constitution. In Romans 13, we are told, “Obey the government because God put it there.” TRUE! The Constitution IS the government and God put it there. The people in Washington should obey the Constitution. And we are told to pay taxes too. We are NOT told to pretend that paper is money and pretend to pay taxes with it. We must get Congress to once again coin money so that we will have money to pay taxes with. Lincoln’s legal tender acts made all of the abominations mentioned in this book possible. It is claimed that he later repudiated those acts in public for which he paid with his life. It was proved in the Civil War that people would not voluntarily finance a war with something they worked hard to produce. Modern wars would be impossible without legal tender. To end all wars, communism, and inflation, Ron Paul’s H.R. 391 MUST be passed. It will repeal all legal tender laws and repeal the privilege of banks to create the money wars are financed with. In the meantime, the best book on the subject of inflation and how to end it is The Miracle On Main Street by F. Tupper Saussy. This is a pleasant history book on how and why Article 1, Section 10 was put in our Constitution. It is a book that ANYONE would enjoy reading. It is not as radical as this book in your hand. The book IS causing “miracles” and has resulted in the monthly publication of The Main Street Journal to report on the gains of those fighting for our Constitution. With new knowledge, an Alabama farmer is suing a bank for 1.7 million “dollars” and should win the suit. You need a subscription at 30 bucks a year to keep posted. The book is 6 bucks. For a little book to show you how really incredible this moneyless monetary system is you need a copy of Credit Is Debt Is Slavery by Bruce McCarthy for 3 bucks. For still more detail, a copy of Treadmill to Oblivion by Merrill Jenkins for 10 bucks will leave little doubt about where it all must end. As this book goes into circulation, the author goes out of circulation for refusing to waive his rights and honor Karl Marx. Please register to vote so that you may get to be a juror. Please help circulate this book. You must help your neighbor see the truth. Skillful use of words is vital in getting the people to believe what isn’t so. Control people’s words and you control their thinking. Control their thinking and you control their minds. Control their minds and you control their bodies. Words are used for communications. Control of Communications is part of 6th plank of Communist Manifesto. Merrill M. E. Jenkins, Sr. M.R. Who can deny that slavery exists when a group of people regularly and systematically takes the production of others, day after day, year after year, without offering anything they produce in exchange? Who can deny that 15,000 commercial bankers and twelve Federal Reserve banks regularly and systematically take the production of others in whatever quantity they want without offering any production in exchange? What better way to conceal their fraud than to have their victims ridicule and condemn other victims (like this writer) who recognize the fraud and protest? Just a few words of protest would leave the average citizen calling the protester a “communist” because we are conditioned to think there are two forces in the world — capitalists and communists — and that bankers are “capitalists.” A capitalist is one who uses wealth to produce wealth, but no banker produces wealth of any kind unless perhaps he has a vegetable garden or some hobby. Bankers are definitely not capitalists! 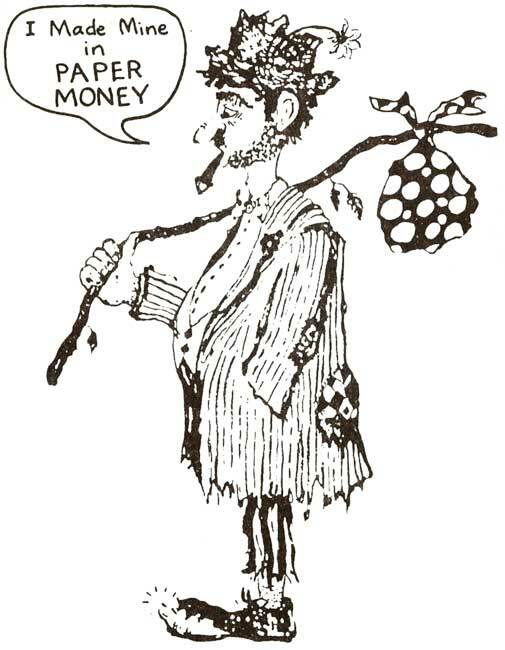 Some 35 years ago in high school, this writer was told that communism is “forcible redistribution of wealth” or “robbing Peter to pay Paul.” Thinking that money is wealth, I pictured a man coming around with a bucket and a gun. You put your money in the bucket and he would go give it to someone else. What do we have today? There is no bucket; it’s an envelope. You can’t put money in it when the banks have reduced your accounts to “merely book entries.” You are expected to put one of two things in the envelope; either you enclose an authorization for your bank to alter your books entries (a check) or a damned good reason why you didn’t otherwise you may meet a man with a gun. I met a man with the gun. He took me to court for refusing to waive my rights and confess to how much of the Fed’s counterfeit I was robbed with! There can be no communism and no modern wars without the credit issued by the world’s interdependent and interlocking banking systems. The income tax and the Federal Reserve Act — now law — are planks two and five of the ten planks of Marx’s Communist Manifesto. If someone forced you to accept sticks of wood for all of your labor, wouldn’t that make you their slave? If they forced merchants to accept those sticks of wood from you, would you be any less a slave? If the sticks of wood were reduced to pulp, made into paper, and printed green on one side and black on the other, with a portrait of a dead president, would be any less a slave? If the first users of that paper got it for absolutely nothing and paid no taxes of any kind and were called “the Federal Reserve,” would you not be their slave? Russia and Congress both borrow from banks. We are told and the Bible says, “The borrower is servant to the lender.” (Proverbs 22:7) America and Russia have the same master? Some 20 years ago, a newspaper reported stated that “communism is a battle for men’s minds.” Do you have any doubt that the communism is banksterism and that banksters control our minds? Will you take some positive action, or let your children die is some phony war financed with bank credit?